Life is not quiet, and the potential for permanent damage to your hearing is greater than you realize. In fact, hearing loss is the third most common chronic health condition, affecting 28 million Americans. Learn how to minimize your risk. You crank up your earbuds to drown out those screechy rail turns on the T. Believe it or not, that can be louder than a jet taking off. You can suffer hearing loss as soon as two minutes into some concerts, You drive a boom car, power up the monster subwoofers, and your bones vibrate. Life is not quiet, and the potential for permanent damage to your hearing is very real. Understanding conversations when you’re in a noisy place? Hearing high-pitched sounds like birds, doorbells, telephones, and alarm clocks? Understanding speech over the phone? You’re always turning up the volume on the computer or TV. You regularly ask others to speak more loudly or repeat what they said. Speech and other sounds seem muffled. IT’S NOT JUST YOUR HEARING. IT’S YOUR HEALTH. The damage caused by prolonged exposure to loud noise is not limited to hearing loss. Negatively affect a child’s development including social behavior and the ability to learn. Disturb digestion and cause an upset stomach or ulcer. Make it difficult to sleep, even after the noise stops. Get the free noise-measuring app from the CDC. You’ll be surprised how loud your life actually is. 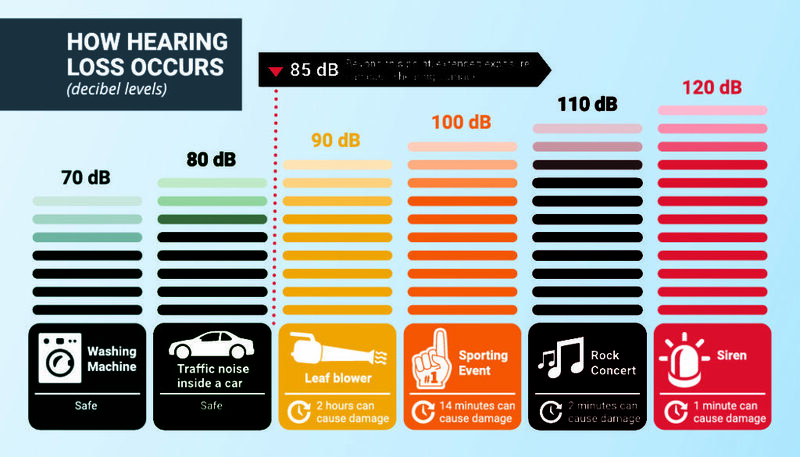 Extended exposure to readings above 85 decibels (dB) can cause hearing damage. You can search “Niosh SLM” in the App Store to download. Lower the sound. Try to keep your earbud volume no higher than 60 percent. You should be able to hear a person talking to you at arm’s length. Wear earplugs when you’re at a live concert or work in an environment with dangerous levels of noise. Limit your time with noisy toys and loud appliances. Try to alternate a loud activity with a quiet one. Get your hearing checked–especially if you are noticing changes or have ringing or buzzing in your ears. Even if it’s just to establish a baseline right now, an audiology exam is a smart thing to do throughout your life. Action for Boston Community Development Health Services and Eta Phi Chapter of the Omega Psi Phi Fraternity, Inc. are co-sponsors of the “Lower the Sound, Save Your Hearing” public health awareness campaign. It was developed to draw attention to the growing number of children and young adults suffering from hearing loss because of exposure to loud noise, particularly extremely loud music.